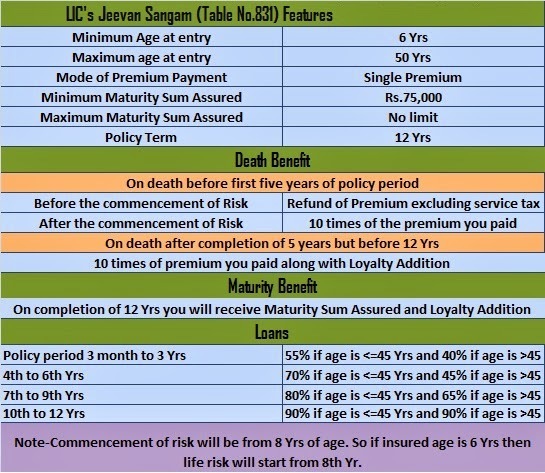 Check out the Features, Benefits and Premium Plan of LIC Jeevan Sangam Insurance Policy. Life Insurance is required for every individual. There are great benefits of having Life Insurance. The Life Insurance Corporation of India announced new scheme of Life Insurance few days ago. Read more about it below. Update :- This year too, to attract Tax payers, LIC india has announced LIC Jeevan Shikhar Plan, which is single premium plan gives up to 6-7% return in 15 years of Policy Term. 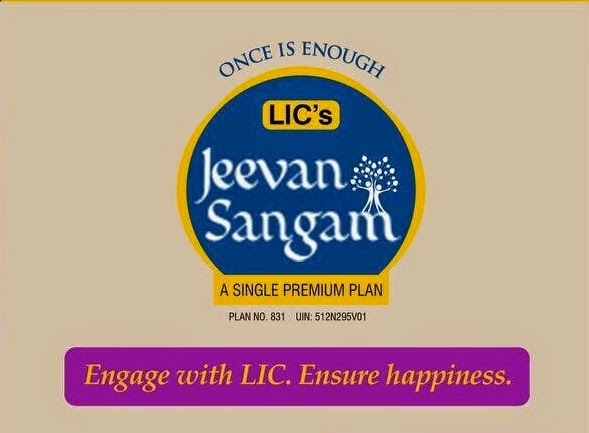 Life Insurance Corporation of India has declared LIC Jeevan Sangam policy that is non-linked single premium plan. Want to avail the policy? Before you get the policy read the benefits and eligibility conditions of it. Here are they. 1. The LIC’s Jeevan Sangam policy risk cover is a multiple of premium paid by the customer. 2. The plan will be open for sale for a time limit of 45 days from the date of launch. 3. Minimum entry age of customer should be 8 years and Maximum entry age is 45 years. Moreover, minimum/maximum basic sum assured is 10 times of single premium paid by customer. 4. Moreover, minimum maturity sum assured is Rs. 60,000/- and maximum maturity sum assured is unlimited. 5. Furthermore, the maturity sum assured will be accessible in multiple of 5,000/- Rs. 6. The term of policy is of 10 years and mode of premium payment is single premium only. If the death occurs at the time of first five years of policy then the basic sum assured which is 10 times the single premium not including any extra premium charged will be payable. If the death occurs after completion of five years of policy then the basic sum assured which is 10 times the single premium excluding any additional premium charged with the loyalty accumulation will be payable. On maturity of the LIC Jeevan Sangam policy, the maturity sum assured with loyalty addition will be payable. Decide on to take the LIC Jeevan Sangam Policy and get secured life ahead. However, loan facility will be available with this policy and it must be equal to 60% of the surrender value as on the date of approval of the loan. What are you waiting for? Plan for the policy and make a great step ahead for your life. Check out more information about LIC Jeevan Sangam. If you have any questions regarding the LIC Jeevan Sangam policy then feel free to leave a comment below and ask a question.